There’s nothing like a grand slam home run to take the lead in the eighth inning during the playoffs. The Chicago Cubs are the favorites in the NLCS against the Dodgers, and scenes like this from their crazy fans make you think this just might be the year when the curse if broken. Amazing, inspiring and also very sad . . . The entire team is wearing #16 in honor of José Fernández. R.I.P. 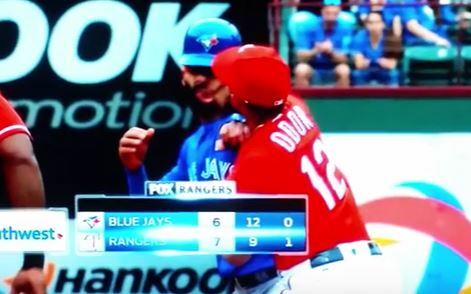 This altercation between Rougned Odor and Jose Bautista will be played over and over again for years. Bautista can be a bit of a punk, and he certainly got what he deserved after he tried to take out Odor with a hard slide. After the game he tried to say he didn’t try to hurt him and was just sending a message, but I’m sure Odor doesn’t give a damn about that. He pushed Bautista and then clocked him. Had it been in the ring it would have been a TKO! The folks at 500 Level haven’t wasted any time . . .